Disney Princesses Dress-Cinderella Dress-Sleeping Beauty Snow White Elsa Belle Dress-Fairy Tale Princesses Dress Outfit. It's the wonderful Disney fairy tale princesses! We have silhouette dresses representing Elsa, Snow White, Cinderella, Sleeping Beauty (Aurora) and Belle just waiting for their handsome princes! We just love this adorable rendition of these famous little fairy tale princesses. 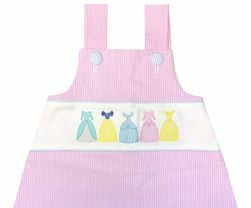 We start with a vibrant light pink stripe seersucker and fashion a dress or swess top (2 inches longer than a swing top). The shoulders fasten with light blue seersucker fabric covered buttons matching the piping around the embroidered panel. The chest is embellished with the white panel embroidered with the princesses. This is our alternative to smocking! We just love the look-so very sweet yet traditional. You may also choose to have a dress with matching light blue seersucker bloomers. 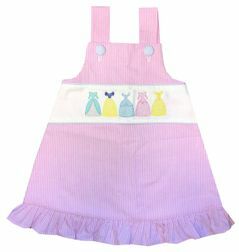 The 2 piece outfit is made with a swess top that is paired with either the bloomers or shorts. The shorts are made with the same light pink seersucker fabric and ruffles. Light blue ric rac embellishes the dress/top and above the shorts' ruffles.